Twinkle lights are a standard dorm decor accessory. But why be like everyone else in your college dorm? 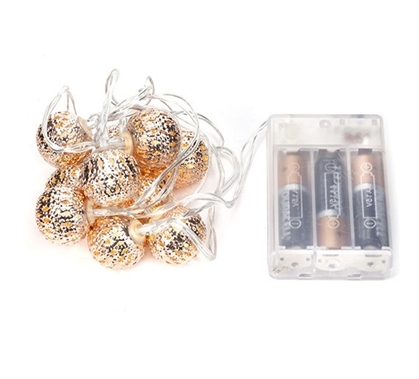 Add some spice to your college dorm with our Moroccan Battery Lights with Copper Wire. Perfect for showing off your heritage, adding a sentimental flare to your dorm decor, keeping you focused on that trip to Casablanca you’ve always wanted to take, or just adding a gorgeous gold accent to your college dorm -- these 10 Moroccan Battery Lights are a great college dorm decor accent accessory. Four feet of flexible copper wire means they’ll stay in place without fuss, and because they’re a great length, they’re perfect for framing your college dorm desk, the head of your Twin XL bed or hanging on your dorm photo wall. And the best part? Because your Moroccan fairy lights are battery operated, you have the flexibility of hanging them where ever you want in your dorm room, while keeping your college surge protector outlets free! Show off your personal style, your heritage, or just your love of Moroccan-inspired gold accessories and deck out your college dorm decor in a way that is uniquely you.